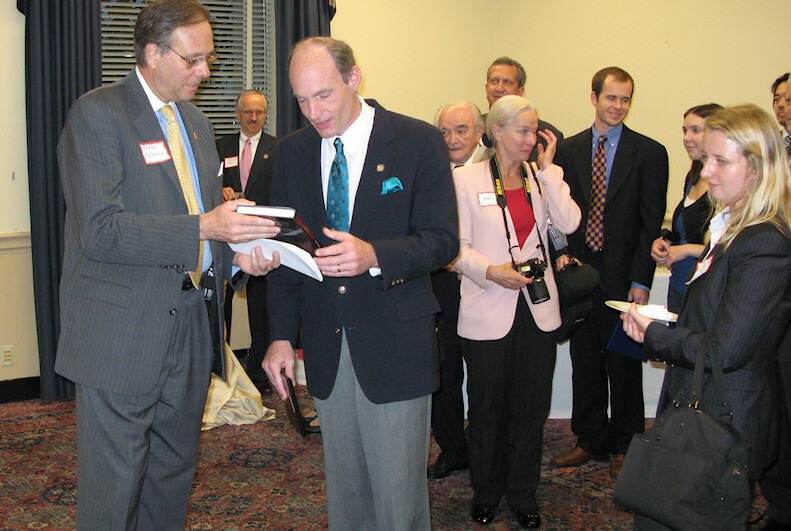 11/1/2007 - Congressional Reception for AHF Centennial... AHF celebrated it's 100th Anniversary, honored the heroes of 1956 on the 51st anniversary of the Hungarian Revolution, and unveiled its plans for a 1956 National Memorial in the Nation's Capital. AHF recognized Congressmen Dan Lipinski (D - IL), Thaddeus McCotter (R- MI) and Dr. Lee Edwards (Chair of the Victims of Communism Memorial Foundation) for their support of AHF initiatives, human rights and democratic development in Central Europe. Each received a plaque and a copy of the book, "Daughter of the Revolution" by renowned poet and author, Prof. Peter Hargitai. The October 25 commemoration started with wreath laying at the Victims of Communism Memorial near the US Capitol. 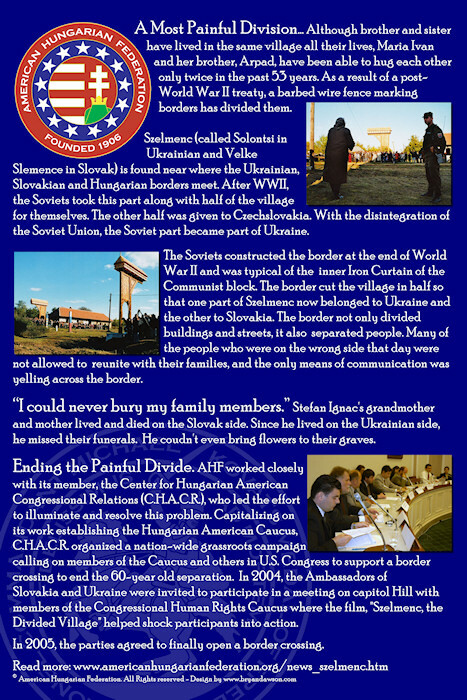 The Victims of Communism (VOC) Memorial was dedicated by President George W. Bush in a morning ceremony on Tuesday, June 12, 2007. Washington's newest memorial honors the 100 million people who have been killed by communist totalitarian regimes worldwide. 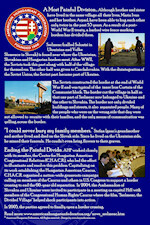 AHF is proud to have contributed to this great effort. Dr. Lee Edwards, Chair of the VOC Memorial Foundation) addressed the audience on this cold, rainy day reminiscent of those fateful days in Budapest 51 years ago. 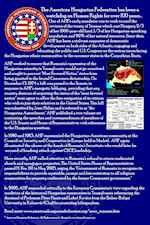 The Rayburn House Office Building was the site of the reception where more than 100 guests viewed a display of AHF history. Guests included Hungarian Ambassador Ferenc Somogyi, members of the Polish-American Congress, and members of the Central and East European Coalition (CEEC). Frank Koszorus, Co-President and Chair of the International Affairs Committee opened the awards ceremony introducing the Congressman and Dr. Edwards and distinguished guests. 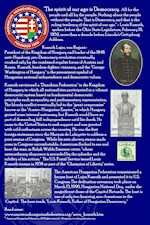 The day before, in the House of Reprentatives, Congressman Dan Lipinski rose to congratulate the Federation on its centennial. 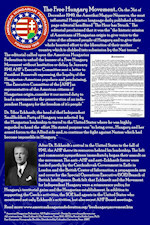 His Chief-of-Staff read the Congressman's statement: "Madam Speaker, I rise today to honor the American Hungarian Federation on their 100th anniversary. 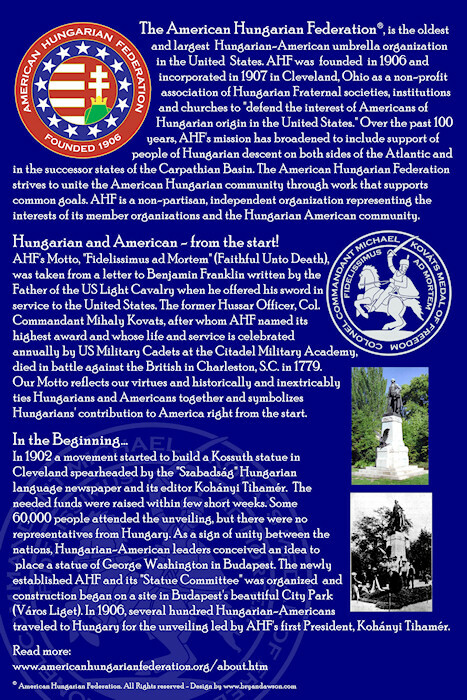 This group, formed in 1906 as a vehicle to advance and protect the interests of Hungarian-Americans, is one of the oldest ethnic organizations in the United States. 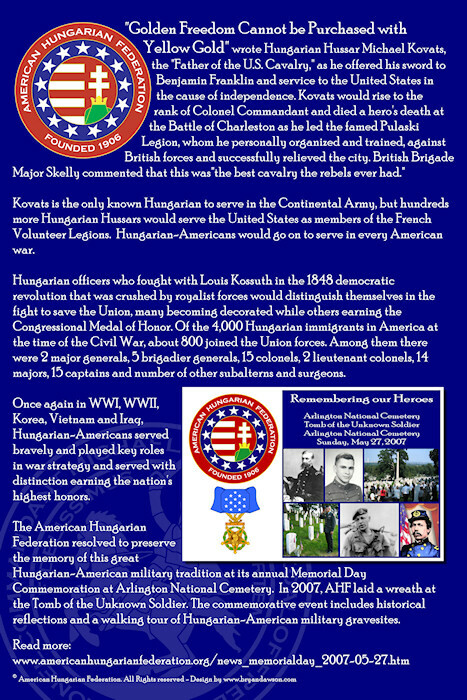 Hungarians have been outstanding contributors to our republic since the days of its inception, when Col. Commandant Mihaly Kovats, the Hungarian officer who led the first American cavalry into battle, died fighting the British at Charleston, S.C. in 1779. 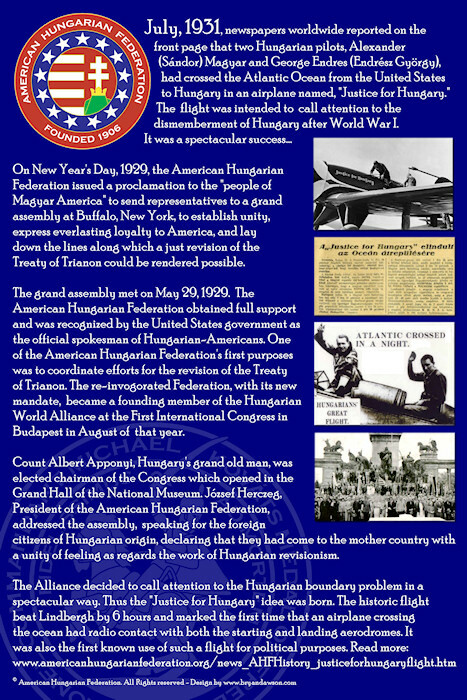 Their exceptional service and patriotism were again exemplified in 1906 when Hungarian-Americansraised funds for the erection of a statue of George Washington in Budapest, one of the first acts of the newly-formed American Hungarian Federation." 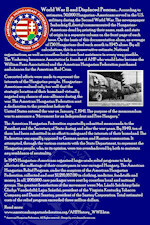 [download the Lipinski Congressional Record] Zoltan Bagdy, AHF Co-President, presented the award plaque to the Chief of Staff. Akos Nagy, AHF Chairman, introduced Congressman Thaddeus McCotter who gave a stirring speech honoring those that have stood up to brutal dictatorship and thanked theFreedom Fighters of 1956 for their sacrifices. 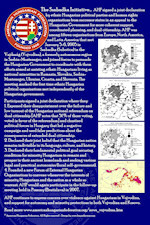 Both Congressmen Lipinski and McCotter have been strong supporters of democratic development in Central Europe and support the Federation and its work with the Central andEastEuropean Coalition (CEEC). 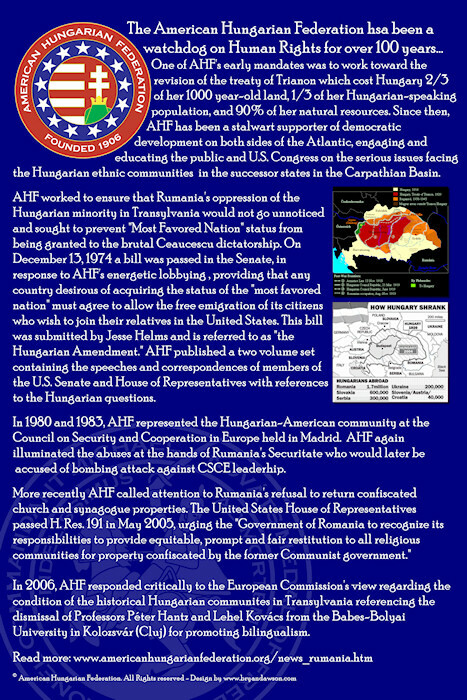 Dennis Kucinich (D-OH) had also honored the American Hungarian Federation of Cleveland, the city of AHF's founding, in March. 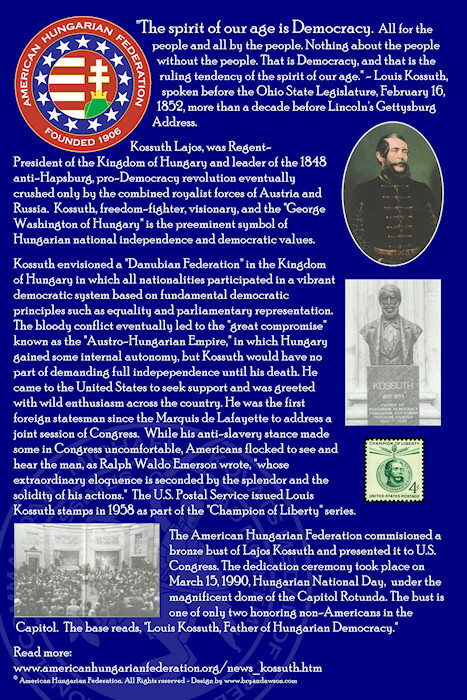 Congressman Kucinich remarked, "For more than one hundred years the AmericanHungarian Federation has worked to unite and to support Americans of Hungarian origin in the United States, regardless of political, religious, or other affiliation. 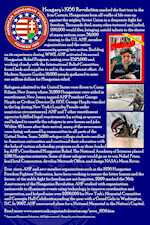 It has also been a strong supporter of freedom both at home and abroad. 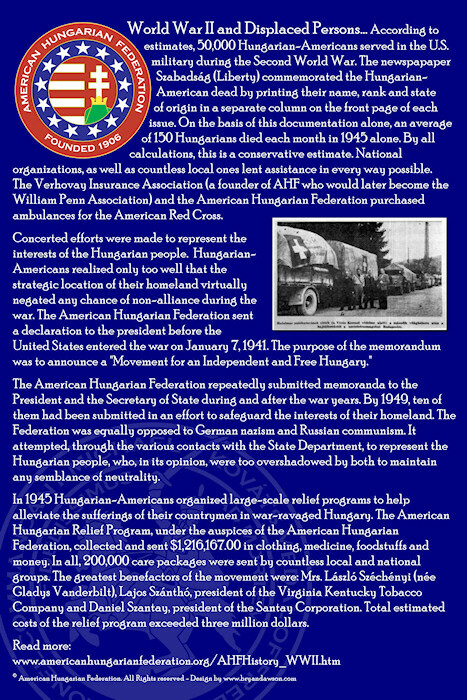 They played an integral role in providing aid for a Hungarian people in need after World War II, as well as efforts to aid refugees of The Revolution of 1956." [download the Kucinich Congressional Record]. 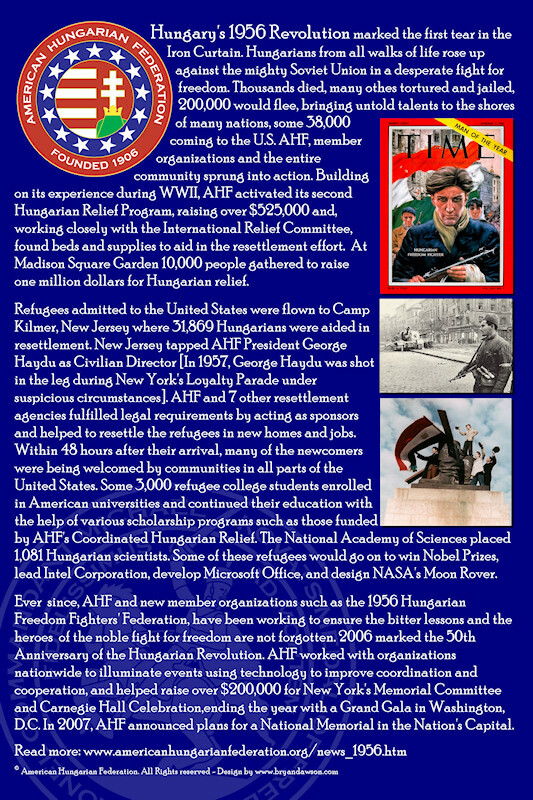 Dawson then unveiled AHF's plans for a National Memorial to the Heroes of the 1956 Hungarian Revolution in the Nation's Capital! AHF selected the inspiring "Spirit of 1956," seen here, by renowned artist Gyuri Hollosy whose works have been acclaimed across the nation. 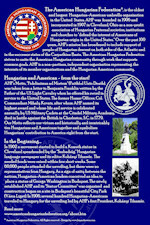 The memorial depicts an angel, rescuing a Freedom Fighter, as he clutches the hollow flag of the revolution. 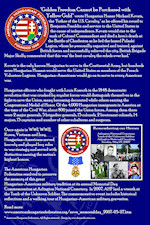 [read more] about the memorial and get involved!! 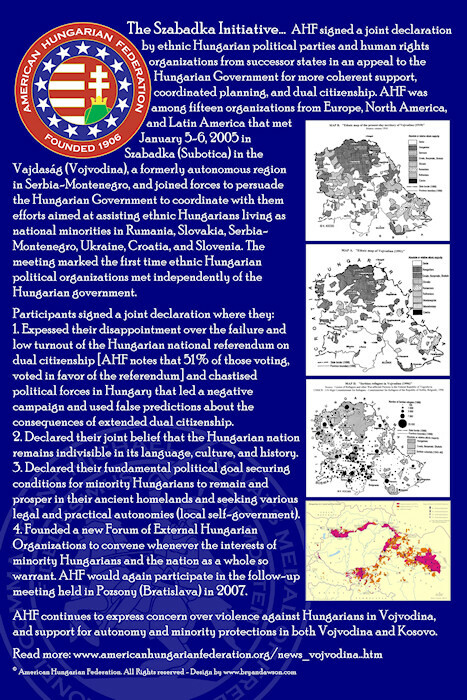 See our events commemorating the 1956 Hungarian Revolution from 2005 and 2006. 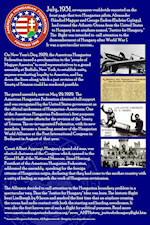 1956 Portal - www.hungary1956.com - The American Hungarian Federation is helping to coordinate events across the country! Join Us! 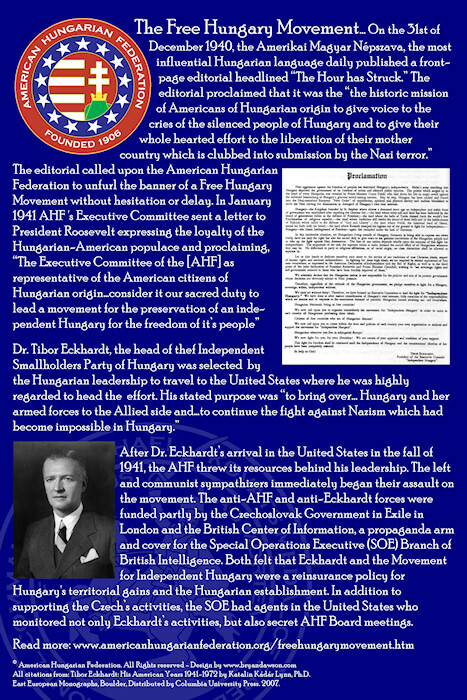 The 1956 Institute, (1956-os Intézet), headed by Dr. Janos Reiner, is a great site devoted to exploring the 1956 Hungarian Revolution in English and Hungarian. Time Magazine's gave Hungarian Freedom Fighters the title "Man of the Year" on July 1, 1957. "The Freedom Fighters filled the empty bottles with gasoline and corked them with table napkins, making what they called 'benzine flashes."